We were worried about holding a workshop on January 3, but it seems that everyone was eager to get out of the house after the holidays. We had 21 members in attendance, and Bill Stearman was an engaging instructor. It was a wonderful way to start a new year of quilting. By providing kits for each of the four blocks we worked on, Bill made it possible for us to focus on the technique of creating double disappearing nine patch blocks, and four di&erent ways of putting them together. For each of the (rst three approaches he started with a mini-lesson and had examples on display, and then gave us a fabric kit with a set of instructions on how to make a cushion cover block using that approach. He also included a pattern for a full quilt using that approach. All three of those quilts had been included in his backpack show for the full guild on the previous day. It was lovely to come away with three quilt patterns, all with clear instructions and helpful colour pictures. We started with "For Baby and Me" for which we used bright colours and a random arrangement. The second block was "It's a Breeze", for which we used orange Tanzanian prints and a complementary black. The arrangement of the quarter blocks resulted in a striking chain of squares. The third block, "It's a Slippery Slope",required just two colours and the arrangements created an interesting step-wise pattern. By this point we were all comfortable with the creation of the double disappearing nine patch, which involves two stages of forming a nine patch, and then cutting it infour. However for the (rst three approaches, all that was required was to rearrange the (nal set of quarter blocks and sew them together. 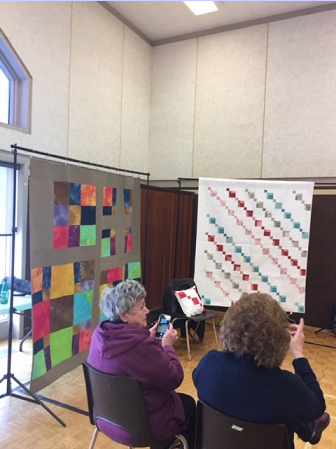 For his improvisational approach, which is what he uses to create so many of the wonderful quilts he had showed us in his backpack show, there are no instructions for for how to create the (nal block. 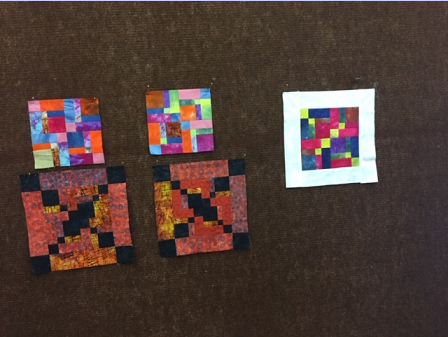 He challenged us to get together with a partner or a group, and to each produce four quarter blocks using similar fabrics, and then to create a collective quilt made from them. 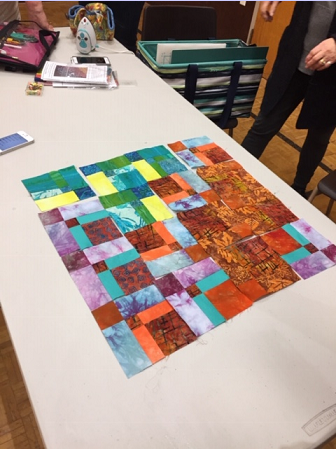 Using this approach enables the interconnected range of colours that was evident in his quilts. This was by far the most di5cult task of the day. 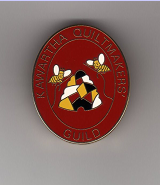 The workshop was accessible for all levels of quiltmakers, from novice to expert. 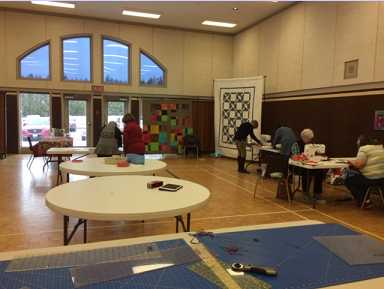 We were all able to leave with ideas and patterns for traditional or modern quilts, and inspiration to create them. We hope to see some of the quilt blocks, whether they have been made into cushion covers or not, at the February meeting. We may even see one of the collective quilt creations!